Winter packs are very different from the packs we carry the rest of the year. Mine definitely are at least. It can be the same physical backpack, but the things that need to be carried are so different that it really changes the whole concept of how the pack is used. 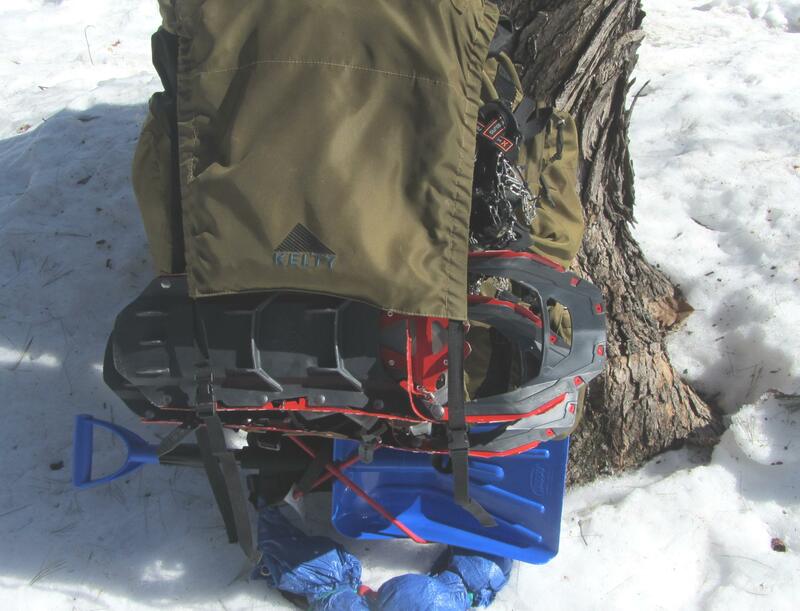 The most obvious difference is all the extra gear that needs to be carried outside the pack; shovel, snowshoes, spikes, skis, ice axes… Most of these are things you need easy access to at times you need to use them, but they need to be secured in a way they won’t be lost in the snow. Sharp edges mean you have to be extra careful that they don’t cut themselves free of whatever is holding them on, other gear or the pack itself. Even with all that going on you still want to have access to things inside the pack too. It really can become a puzzle to figure it all out, but putting some thought into it ahead of time certainly pays off when you’re wading through deep powder and won’t find a dropped item til spring. My pack changes a lot on the inside as well for winter. Most of the year, in terms of cubic inches, I’m carrying more food than anything else. In winter that changes as insulation takes up so much more space. Normally I bottom carry my sleep system, keeping food and sleep clothes in the main compartment and most everything else in side pockets. The winter pack flips that around with the top quilt needing about twice as much space as the Ventra, extra clothes and of course puffy outer insulation for camp. These items take over the main compartment with additional insulation such as hats and multiple types of gloves invading the side pockets. Food, stove, fuel and insulated mug get relegated to the bottom pouch, but since so far the trips are all really short that hasn’t been an issue. What has been an issue I’ve found is odd moments of confusion. Normally I instinctively know where every item in my pack is without hesitation. Everything always goes where it belongs until used and once used returns immediately to that same place leaving no doubt where any item is. Then, for the short cold weather months everything is some place else heh. Instead of instantly being able to reach out and grab whatever I need I have to wait til my first instinct is overridden by my second. It has been a fun winter of playing in the snow, but I’m glad to see it go for more reasons than getting my regular pack in order again. Planning is off to a slow start this year, but the rumblings have begun. I can feel the trails pulling at me and I know I will answer. Family trips with the girls, the annual week with the guys from Texas is almost set and an old friend from California is threatening to come back for another adventure. Hopefully I’ll find some time for solo trips or I may have to find a new trail name. Hmmm, maybe Vermont? This entry was posted in Nature, Uncategorized and tagged Backpacking, Camping, Hiking, Maine, Vermont. Bookmark the permalink.